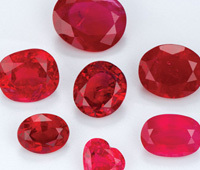 Natural Ruby is one of four “precious” gemstones (including Diamond, Emerald and Sapphire) known its rarity, monetary value, and hardness (second only to Diamond). 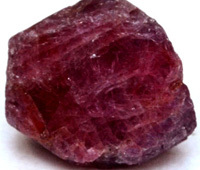 Ruby is red Corundum, an aluminum oxide mineral with chromium responsible for its rich, red colour. The name comes from the Latin word rubeus, meaning “red,” and until 1800 when Ruby was recognized as a variety of Corundum, red Spinals, Tourmalines, and Garnets were also believed to be Ruby. All other colour varieties of Corundum are designated as Sapphire. One can wear or carry Ruby to overcome exhaustion and lethargy. It stimulates circulation and amplifies energy and vitality to the whole system. However, those who are highly sensitive or irritable may find this stone over-stimulating or uncomfortable to wear. Ruby has been known to calm hyperactivity in some individuals. Ruby stirs the blood and stimulates the heart, encouraging one to enjoy being in the physical world. It has always been associated with love, especially faithful passionate commitment and closeness. In antiquity Rubies were considered to be perfect wedding stones. 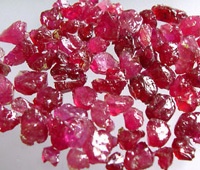 All natural Rubies have imperfections within them, including colour impurities and inclusions of Rutile needles known as “silk.” These inclusions help distinguish natural Ruby from synthetics and when structurally-oriented so the light shines off the “silk” in certain ways, the inclusions actually increase the rarity and value of the stone. If cut en cabochon, these special stones may display a chatoyancy, or rare “cat’s eye” effect, or in the case of a Star Ruby may display a six-rayed star effect called asterism, that causes the light rays to appear to glide magically across the stone as it is moved. Vast reserves of precious stone “Ruby” has been found in mountainous region of Neelum Valley, Hunja, Gilgit districts, Azad Jammu and Kashmir. According to a report, the discovery of the gemstone is being considered a big success as it could lead to uplift and prosperity of the state.